Master of Graphic Design, Thesis Project North Carolina State University, College of Design Committee: Santiago Piedrafita, Meredith Davis, Kermit Bailey Fall 2013-Spring 2014 Abstract Place branding is a new practice that involves cross-disciplinary processes of collaboration among designers, urban planners, policy makers, and other pertinent stakeholders. Traditionally, the graphic designer’s role in this process has been limited to designing visual identities or common touchpoints for Place Brands. New advancements in Information and Communication Technologies (ICT) have brought upon a new landscape to the emerging practice of place branding. This revolutionary change has happened particularly in the way that citizens communicate to, with, and through place branding communication systems and the information flows in the system itself. In addition, an inevitable involvement of citizens and all other stakeholders in the process of place branding is apparent. In other words, if efficiency and the success of a place brand are to rely on citizen participation, a place branding communication system should consider participatory culture in its design. In this regard, I here redefine communication systems for place branding in light of most recent advancements in new information and communication technologies, particularly Social Media and Ubiquitous Computing, in order to stimulate citizens to participate actively in the process of Place Branding deployment and maintenance. How can the design of a digital communication system stimulate citizens to participate in the process of deploying and maintaining a Place Brand for a middle size city in the U.S.? As previously mentioned, an identity-formation definition of place branding is the theoretical foundation underpinning this research investigation. In a more robust definition, place-identity has the following characteristics. First, place has a dynamic quality, which means place-identity has temporal aspects and evolves over time3. Therefore, there is no single and static identity for a place, rather identity is a process. For example, both history and proposition (future planning) of a place are part of its identity. Second, place-identity is a complex network of associations and relationships among place elements, which is impossible to represent whole. This complexity also reminds us places cannot simply change their identities by means of short-term branding campaigns. In other words, identity cannot be imposed on a place. With such definition of place-identity, the role of a place brand is to mediate and reveal such cloud of relationships and associations (Kavaratzis and Hatch, 2013). In this view, place branding is an overarching concept that does not disregard the complexity of place-identity, rather embraces it as a mesh of relationships. An effective place brand must therefore address the complex and messy nature of both place and identity. Diagram shows the elements, flows of information and relations in a system map, which I created based on Kavaratzis’ model of place branding. Although this system model is inclusive and covers all aspects of place elements that have impact on place identity, the hierarchy and the organization of elements has not yet considered the shift from traditional media to web 2.0. In other words, the flows of information are still influenced by controlled and one-way media. As Fouts (2010) states, the order of information flow is no longer hierarchical and top-down in our web 2.0 world; rather, it is dynamic. Therefore, in this system there are fewer opportunities for grassroots organization. 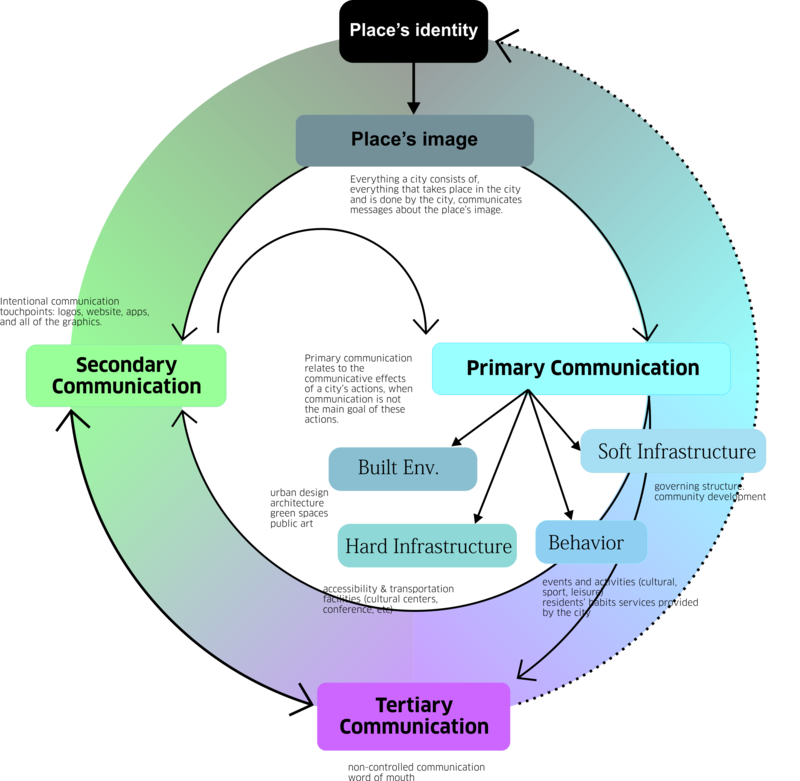 A Place Brand Communication System is a set of communication channels that are coherently interconnected in a non-linear structure through which messages or information regarding place-identity circulate and, over time, impact the process of place-identity formation. As mentioned earlier, place branding has three types of communication. The problem in the conventional model is that it describes the relationship between a main system’s elements and flow of information that collectively impede citizen participation (See Diagram 2). In fact, this system is mainly based on controlled media. Thus, a new communication system should be redefined in order to take full advantage of new information and communication technologies. In addition, the system has to consider participatory culture in its architecture. In the process of redefining this new system, I pursued two design investigations. These investigations address the relationship of users with primary and tertiary communication elements. Moreover, I am examining the ways through which users may have different levels of participation in the process of identity formation. As far as systems-thinking process for developing a communication system, I have defined seven phases (See Diagram 1). The first phase defines the overall structure of the system, already mentioned in section 2 (Place Branding Communications). The second phase maps the system and elaborates its elements and subsets. In the next step, I define two design investigations in order to examine and explore opportunities in different parts of a system map. 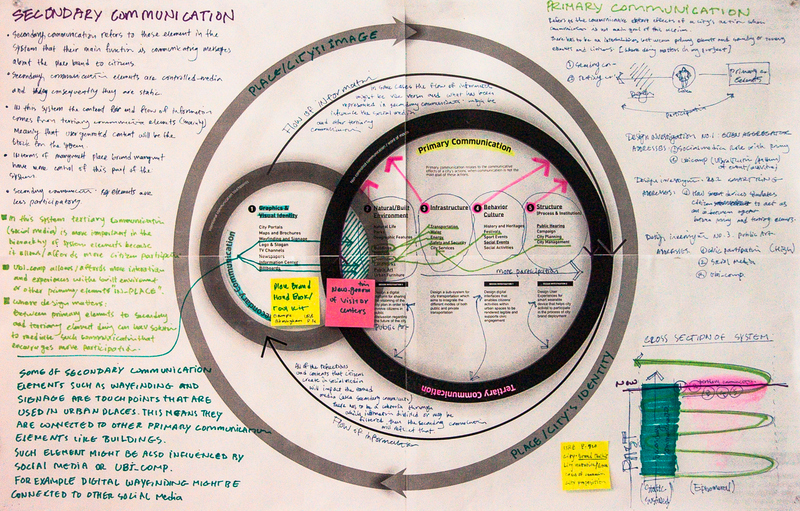 In the fourth and fifth phase, I examine the system through the lens of human-centered design. 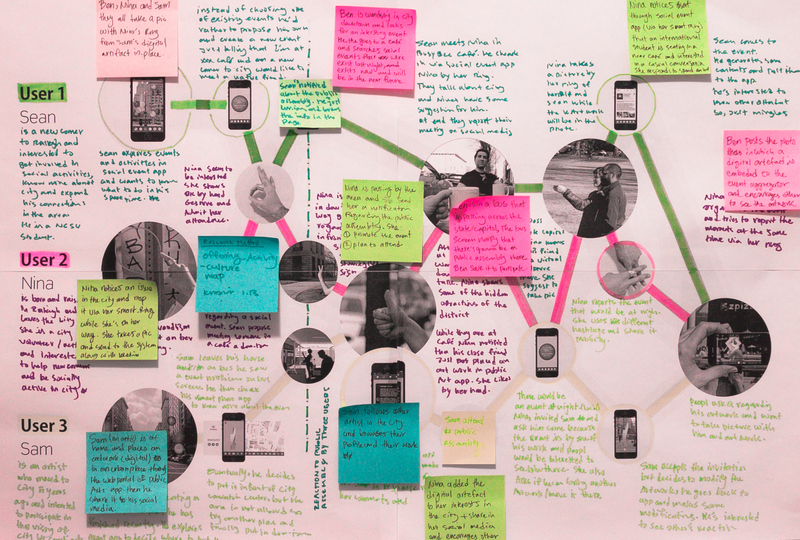 In fact, I created provisional users and matching personas, leading to counterpart user journeys and scenarios. Informed by human-centered methods, I identify different user experiences, behaviors, and actions of users within the communication system. Moreover, these methods may lead toward a reconsideration of the system and its mapping (phase 2). The next step is to explore the system through designing platforms, experiences, and interfaces based on previous steps. In addition, there are several back and forth processes, and feedbacks from the design investigations that help revise and improve the system map. In this phase, I developed a communication system through mapping a diagram and analyzing system elements, relations, attributes, and flows of information. This method helps highlight interactions among elements and resulting sub-systems. In addition, mapping the system helps identify flows and relationships. 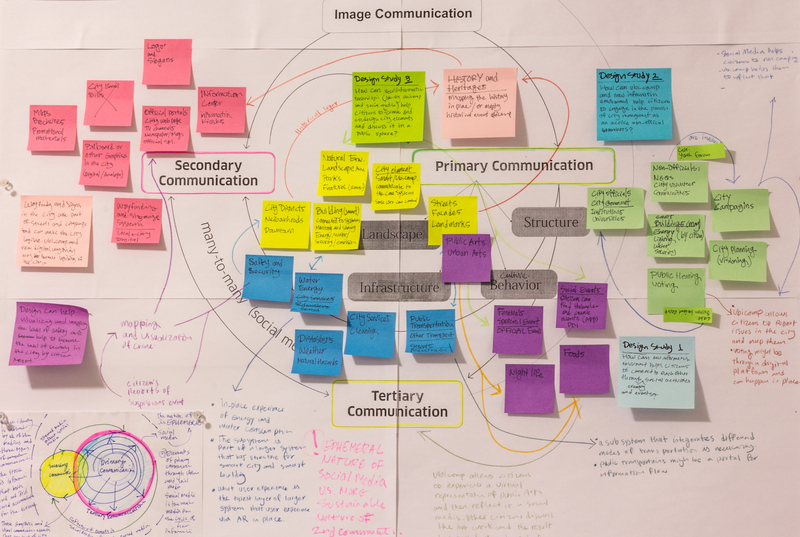 Before explaining the system map, it is worth defining elements, relationships, attribution, and flows in a place branding communication system. Elements are definable parts of the system that communicate place-identity. As mentioned before, in this investigation there are three types of communications, which work as major elements in the system (i.e. primary, secondary, and tertiary communications). In the meantime, each one of these elements has its own subset. Additionally, there might be some subsets such as environmental graphics, which are common between primary and secondary communications (e.g. wayfinding systems, information centers, etc.). Relations describe how elements (and their sub-sets) are connected to each other. For instance, in a place branding communication system, there are relationships between primary and tertiary communications that mediate messages, facilitate participation, or reveal identities. These are opportunities where graphic design may come into play. Graphic designers may suggest creative solutions such as platforms, or interfaces that support appropriate relations. Attributes refer to characteristics or descriptions of each communication element (along with their subsets) and their relation. Some of the attributes of secondary communications are: static, non-participatory, and controlled. Flows refer to circulation and direction of information that is communicated by different elements of place. System mapping as a design method helps create an overview of the system‘s operation and reveals structures and relationships. In the process of mapping the system, I started with a conventional model of place branding communication (Diagram 2). Then, I tried to redefine the relationships among elements based on the new information and communication technologies advancements (particularly social media and ubiquitous computing) in order to support a contemporary and identity-oriented approach to place branding. In addition, I considered participatory culture as a core value in redefining and mapping the process. Thus, my argument is that the system should be redefined in a way that citizens have the primary role in developing and maintaining the system. In this light, the relationship between tertiary elements and other elements should be changed first. Additionally, the flow of information needs to change in order to support a bottom-up and a grassroots organization of citizens. In this view of the system, citizens are no longer a passive audience; rather they are initiators, co-creators, publishers, interpreter, advocates, and reporters who are actively involved in the process of identity formation. In the flow of information initiated by primary communications, citizens take on different aspects of primary elements through social media and other tertiary communications (non-controlled media). Such user participation help shape a public sphere that is co-created by citizens and, more importantly, open to all users. Throughout the system, information and data gradually populate different platforms. Collectively, all of these inputs, contents, and reflections end up as secondary communications. It is then that conventional media transmit what citizens have co-created through different channels in different ways, and again the flow of information returns to primary and tertiary communications through feedback loops or balancing feedback loops. 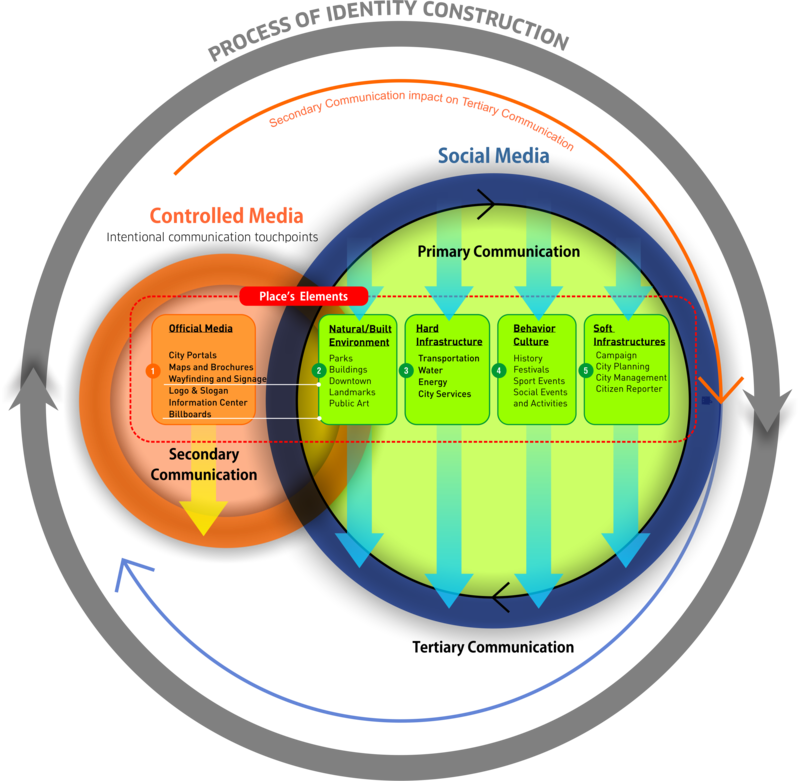 This cyclical flow of information continues over time and influences the process of identity formation. As far as the system dynamics, the process of identity formation is like a spiral that transcends (i.e. the process of identity construction moves towards the future) over time. In this evolutionary process, secondary communications and tertiary communications have different relationships with temporal aspects of the system. Tertiary communications, particularly social media, reacts to and reflects a place’s identity faster than secondary communications. In the meantime, social media is ephemeral by nature; therefore, the system stock will last shorter than the information stock in secondary communications. Diagram 3 is a cross section of a system map that shows these system dynamics. Considering the implications of a new media revolution, especially when taking into account social media and ubiquitous computing, I believe the relationship between system elements and flows of information must change in a contemporary place brand’s communication system (See Diagram 3). First, social media brings forth a new set of possibilities to place branding. Nowadays, the reputation of places are more than ever controlled by citizens rather than the media establishment (Govers, 2013 a). Social media revolutionizes tertiary communication and radically changes its relationship with two other types of communication (primary and secondary communication). In fact, social media takes the role of non-controlled media in tertiary communication and allows citizens to reflect elements that are in primary communications. This major shift happens when social media reverses the direction of information flow in the system. In other words, citizens are not mere receivers of messages anymore; rather, they are active participants. Consequently, social media allows for the grassroots organization of citizens in place branding. However, people’s activities on social media per se will not have a meaningful impact on place-identity. Govers suggest that people must have a compelling story to tell or share through social media, which he names “Symbolic Actions” (Govers, 2013 a). In fact, the role of graphic designers is to facilitate this process of storytelling for them, and create mediatory modes through which citizens are encouraged to share their stories through social media. Such macro stories eventually form a co-created narrative of a place in the public sphere through which participatory culture grows in a society. This argument also addresses the different levels of citizen participation. In fact, ultimately, the objective is to elevate the level of participation from simple actions such as liking or rating posts on social media to more sophisticated actions such as macro-storytelling (See Diagram 3). Ubiquitous computing revolutionized the relationship between citizens and environment so that everyone may interact with a system everywhere at any time. Likewise, it is possible to locate objects, subjects, and behaviors. For example, people’s activities in urban spaces can be rendered in a digital environment so there will be more digital representations of primary elements. 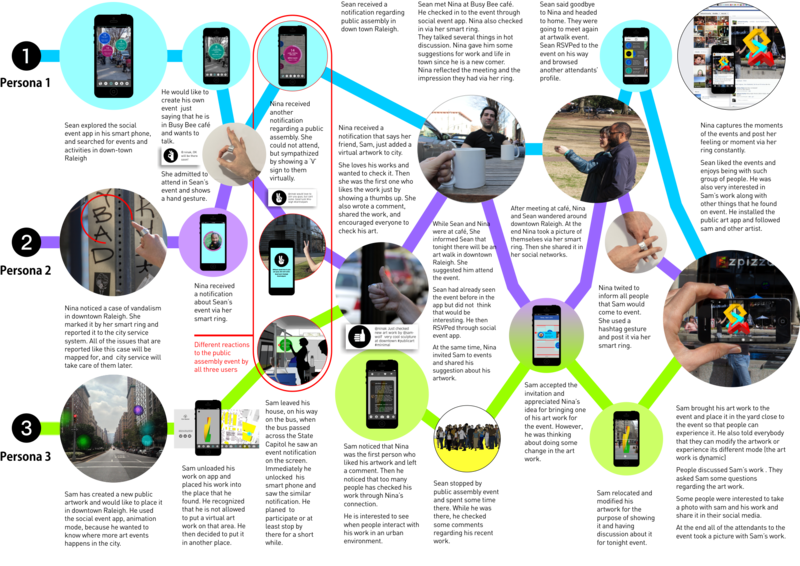 Ubiquitous computing suggests smart environments within which all elements can communicate to each other. Ubiquitous computing also integrates three types of communications. For example, buildings as one of the major elements in primary communication are now capable to be an interface and communicate with other elements such as city services. Likewise, mobile technologies afford to bring secondary types of communications in urban spaces. Overall, the hierarchy of elements and flows of information in the new system allows more citizen participation and citizens may actively engage in the process of identity formation for the place they live in. Diagram 3 is a system map that shows this new organization of elements and flows of information. Section 3 will cover this in detail. The scenarios below portray one-day stories of regular behaviors and activities of three personas in the urban environment. Scenarios follow their interests and have different interactions with elements of the city. There are also points in which they interact with each other. This scenario mapping consists of three storyboard lanes for three personas. User 1 intends to explore events and activities in order to expand his connection. User 2 tries to connect people and support them in different ways. She is also interested in doing some volunteer activities for the city. User 3 has created an artwork and wants to share it with other citizens and eventually have a social relationship with them via his works. Besides these mentioned experiences, there are moments in which three users interact with each other or share an experience indirectly. For example, in this scenario a public meeting is happening in downtown Raleigh. All three personas receive notifications regarding this event from different channels. The connecting lines in the scenario map indicate these moments. At the end of the story, all three personas meet at the event, which is about one of Sam’s artwork. As diagram 1 shows, there are several back and forth movement between scenario mapping and design investigations (Figure 1 shows one of pre-final stages of the scenario map). Therefore, after this process all of design investigations, outputs can be seen in the final scenario map. All three users have experiences with both platforms that are designed for events and artworks. However, the first and third users do not have any direct experiences with the outcome of design investigation 2’s wearable device. First, stimulate citizens to co-create, co-manage, co-design, share, debate, rate, report, and more. Second, facilitate citizen-to-citizen and other social connections by easy-to-use interfaces that increase accessibility, legibility, and in-place experiences. Third, encourage dialogues and discussions in a digital environment that collectively helps shape the public sphere as a dialogic space for place branding. Fourth, define feedback loops and balancing feedback loops that insure system operations over time. In this regard, I defined the following three design investigations to address said concerns and to explore how design can play a crucial role in the advancement of a new system. Design investigation 1 addresses social events and activities as one of the primary communication elements. In this study, I have designed a platform for collecting social events and activities from different social networking platforms through which users can have in-place, easy interaction with events that are around him/her. Design investigation 2 addresses public art as one of the built environment elements under the primary communication category. In this investigation, I study a sharing platform through which citizens can co-create and share their digital and virtual artworks.